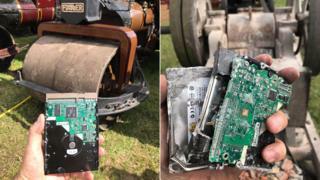 A hard drive containing unfinished works by Terry Pratchett has been crushed by a steamroller, as per instructions left by the fantasy novelist. It is thought up to 10 incomplete novels were flattened at the Great Dorset Steam Fair. The six-and-a-half tonne Lord Jericho was used to roll over the hard drive several times before a concrete crusher finished off the remains. The creator of the Discworld series had been battling Alzheimer's disease. Before vanquishing the hard drive, Rob Wilkins, the writer's long-serving assistant, tweeted that he was "about to fulfil my obligation to Terry". Richard Henry, curator of Salisbury Museum, said: "The steamroller totally annihilated the stone blocks underneath but the hard drive survived better than expected so we put it in a stone crusher afterwards which I think probably finally did it in". He said Pratchett did not want his unpublished works to be completed by someone else and released. He added: "It's something you've got to follow, and it's really nice that they have followed his requests so specifically. "It's surprisingly difficult to find somebody to run over a hard drive with a steamroller. "I think a few people thought we were kidding when I first started putting out feelers to see if it was possible or not."